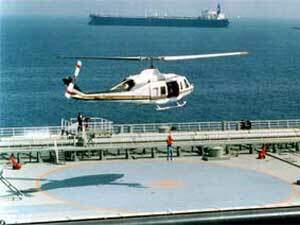 A Saudi Aramco helicopter conducts a hoist mission on top of an oil tanker. DHAHRAN, SAUDI ARABIA (May 02, 2005) - Saudi Aramco recently received a Platinum Award from the Helicopter Association International (HAI), honoring the fact that the company's helicopter fleet had met the highest industry standards. Saudi Aramco is considered the largest corporate helicopter operator in the world, with a fleet of 21 helicopters supporting the company's oil and gas operations. The achievement adds to the company's overall standing as a leader in the petroleum industry. HAI is a nonprofit organization founded in 1984 that has 1,400 members from more than 70 nations. It serves as the voice of the helicopter industry to government agencies, to promote the highest operational and safety standards. Amer A. Al-Sulaim, executive director of Industrial Services, pointed out that Saudi Aramco's achievement was attained by exceeding stringent qualification criteria in areas such as management policies, flight operation missions and work load, training programs and effective safety programs. "We are proud to be internationally recognized," said Capt. Abdullah Al-Dossari, manager of Saudi Aramco's Aviation Department. "We in the Aviation Department fly approximately 26,000 hours and carry over 750,000 passengers -- both helicopter and fixed-wing -- on an annual basis. With this level of activity, achieving such recognition gives us and our customers the assurance and confidence that we are operating at the highest standards." Al-Dossari added: "Having said that, we will not stop there. We will strive to meet the company's flight requirement in the most safe and reliable manner."